1 Preheat oven to 350°. Spray baking sheet with no-stick cooking spray. 2 Cut eggplants in half lengthwise. Scoop pulp from eggplants, leaving 1/4-inch shells. Roughly chop pulp; set aside. 3 Heat oil in large nonstick skillet over medium-high heat and cook sausage, stirring frequently, until sausage is crumbly, about 3 minutes. Stir in onion and cook, stirring occasionally, until softened, about 3 minutes. Stir in red pepper and eggplant pulp and cook, stirring occasionally, until tender, about 5 minutes. Stir in garlic and cook until fragrant, about 30 seconds. Remove sausage mixture from heat, then stir in Hellmann's® or Best Foods® Real Mayonnaise, 1/4 cup Parmesan cheese, bread crumbs and parsley. 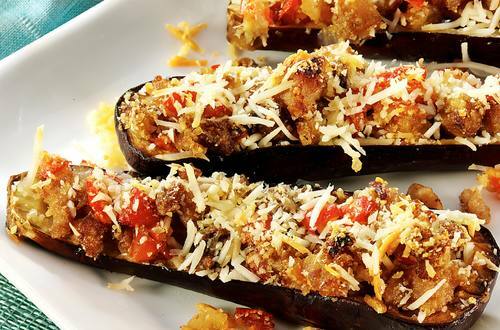 4 Arrange eggplant halves on prepared baking sheet and fill with sausage mixture. Bake until eggplants are tender, about 35 minutes. Sprinkle with remaining Parmesan cheese and if desired, additional chopped parsley.